– Great call to make up for last week’s “technical difficulties” that ended the episode earlier than it should’ve. For one additional comment on the AJ Styles-Rob Van Dam match, the broadcast team played up Lynn’s history with RVD, but they also could’ve played up his history with Styles, who arguably put TNA on the map in its early run with their numerous matches. – The Colt Cabana promo video was random but interesting. Sort of wrapped up Cabana’s “comedian TV host” personality/character. – Interesting to also have Dan Maff appear in the production studio segment with Sam Roberts, though he appeared somewhat heelish joining in the bullying of David Adams, unless that’s the cool thing to do in PWS these days. Could be the latter. – The First Round of the Television Title Tournament match between Eddie Kingston and Chris Payne was better than previous bouts while it lasted, but the finish was decent and Payne was the right guy to go over. It’s good to also note the camera quality seemed much improved on the hard camera compared to recent shows. The postmatch attack by Kingston on Blanchard was also well-done and a great way to step up their rivalry. The commentary was also good, but sounded strangely monotone for the moment with little urgency in their voices. – Good to see the Monster’s Island vignette featured again. We need to remember they are not human and bullets cannot stop them apparently. – The Payne promo was really good and it made sense for him to be angry and want to make a tables match with Kingston. – The Heavenly Bodies (w/”Shining” Edward Jackson)-Rock N’ Roll Express match was an interesting dynamic in the “heel youth vs face legend” way and it wasn’t a great match by any means, but The Heavenly Bodies could use the rub of a win against these guys and they did it using heel tactics like you’d expect. Nothing memorable, but the end result was the important factor. – It was also cool to see Mick Foley making appearances on vignettes as PWS General Manager. He needs more of a “TV presence” in the position though. Why not have him appear in the production studio segments as well? – The Sabu-John Hennigan match had its moments of glory. The stuff with the genie and man-serpent was maybe more of a distraction than anything else, but the broadcast team did a great job of explaining how it enhances Sabu’s character and compared the two men’s strategies brilliantly. Hennigan winning was interesting booking considering the fans seemed more for Sabu. The sportsmanship was cool, but expected. This was another example of youth beating out experience, perhaps the theme of the show here. – The Kevin Matthews promo had him say his beef with Brian Myers was far from over. Being that their Singapore came match was quite entertaining, there are no complaints about this program resuming. Keep the good matches coming. Matthews also has good mic skills, so promos almost come easy to him, which obviously helps. – They replayed last week’s “wrap up” segment, which actually made sense to do with some little additions added in with appearances by CPA and Habib From The Carwash riding a camel. Thoroughly amusing stuff as usual. – The opening video that highlighted the intense weeks-long Kevin Matthews-Brian Myers feud was good for what it was. This was one of the “sleeper” feuds that might’ve fell under the radar, so it was good to start off the show with it, because a lot has happened between the two. – The on-screen chemistry between David Adams and Sam Roberts came across better this week. Roberts’ sarcastic delivery was more crisp and funny here. – The stuff with Eddie Kingston and Chris Payne was one of the better spots on the show. Their backstage segment did its job in terms of setting up their match as Payne caught Kingston scrolling through photos of Tessa Blanchard, his “manager.” Payne was more of a face here, out to defend Blanchard – maybe over-obsessively but still gentleman-like – as it was established that Kingston was a pervert who was obsessed with “banging” her, which made him the sleazy heel. Plus, why are so many segments taped in the bathroom? – The Kingston-Payne match was okay as it already had a storyline with Kingston distracted by Blanchard and Payne as the face, defending his manager. The mystery around Payne and Blanchard’s relationship is also interesting. We’ll see where it leads. She played into the finish as Kingston pushed him into her in the corner and school boy pinned him and pulled the tights. Seemed to be a match to further things more and nothing wrong with that. Payne is on the rise, but you also can’t argue with talent the caliber of Kingston’s. – The Reynolds Brothers promo aimed at The Untouchables and on their previous successful Tag Team Title defenses was decent mic work. They should let them talk more often, as it seems they do have personalities behind all that in-ring tag team pizazz. Let us get to know them more. That’s how fans can truly invest. – The Untouchables promo on their “three man tag team” advantage and keeping which of the three would be the team that competes for the Tag Titles a mystery was good for what it was. They’re basically the “angry team,” which works. It would be Bobby Wayward and Anthony Bowens fighting by drawing straws on stage. – The Tag Team Championship match with Wayward/Bowens and Reynolds Brothers wasn’t anything too special, but the Reynolds Bros have looked good in recent weeks and this was more of the same. It seemed like while The Reynolds were successful, they just took advantage of a backfired attempt by Wayward/Bowens to use the Belts as weapons. They could’ve looked stronger in victory, but this is obviously unfinished business. – Did they need to hype the show that happened the day before multiple times? Big show? Yes it was, but also an outdated one by that point. – It was good to at least see some variety in the Monster’s Island vignette, as this was more Western-styled. – The bathroom promo with Beefcake Charlie and Damian Gibbs on getting revenge on Monster’s Island was decent work from the guys you call The Aesthetic Enterprise. – The impromptu formation of CPA – the socially awkward business man, a hilarious gimmick – and Vampire Warrior (the former Gangrel) as a tag team called Death and Taxes was pretty good. Highlights of their tag match with Gibbs and Beefcake Charlie with Jay Enterprise was decent from what little they showed. CPA’s bottom-rope splash was pretty hilarious and fits his gimmick perfectly. – The Monster’s Island ice cream themed promo was strange yet entertaining. – The PWS World Champion Mario Bokara-Bonesaw feud hype video was good yet dramatic. The match for the Title between them was announced for next week. Good stuff. – Fallah Bahh vs Drunken Swashbuckler vs Dan Maff vs Colt Cabana was also announced next week as a four corners match. – The Bokara hype video of him training was brief, but very good in getting “The Croatian Sensation” over. Similar to the vignette aired earlier in the TV series. – The Macintosh promo towards Habib From The Car Wash was great, as they needed to make it a personal feud now worth a main event. – The Macintosh-Habib match started off decently, but some of the camerawork was incredibly pathetic. Why would they stick to the hard camera on the ring when the action spilled to the outside? They totally missed a hurricanrana spot. The rest of the match had Macintosh toying with Habib from Habib making a noble comeback to get the win. The following angle with Macintosh claiming Habib violated his green card status and was wrestling illegally, having him maced, handcuffed and deported by a police officer was interesting at best, but kind of questionable from a logical standpoint. We’re asked to suspend our disbelief plenty here. Also, the Suicidal Six Way Title was a big Belt featured prominently and since The Amazing Red won the title, there hasn’t been a match since. What gives? – Highlights showed Bonesaw being chased out by The Insane Clown posse after he attacked PWS World Champion Mario Bokara and Colt Cabana. It’s finally reached the point where storylines have begun to progress on the show. Sam Roberts’ interruption of David Adams, who did his TV Studio wrap-up segment was random. Roberts comes off like a mix of Stuart from The Big Bang Theory and Carrot Top. Nothing special about him, even as a heel. Monotone and forgettable. – Bokara’s promo towards Bonesaw was his same rage-driven, heavy-accented tirade like last week. Is he a face now? Either way, he makes Rusev look like a pushover. Good stuff. – The promo with The Heavenly Bodies, Fallah Bahh and “Shining” Edward Jackson involved cheesy broom punchlines as Jackson berated a janitor. They pushed for a “clean sweep.” Starman also walked past the camera. How do you go from World Title number one contender to that? – The American Wolves-Reynolds Brothers Tag Team Championship match was solid and well-crafted. Best thing on the show. The Wolves were painted somewhat as heels and it seemed Adams and Dave D-Struction advocated for The Reynolds. The many near-falls in the match were insanely convincing. If you can check this match out, do it. “The Bad Touch” by The Bloodhound Gang is a strange theme song for The Reynolds, but this was an impressive showing. The sportsmanship displayed between The Wolves and Reynolds was classy, but that set up the emotional impact of the attack by The Untouchables, who dressed in animal costumes in the crowd. This was a good way to debut them on the show and provide some hook into next week. No match was announced though. What slightly hurt this was Adams constantly pointing out The Untouchables were ranked number five in the tag division and weren’t anything to worry about just yet. – Matt Macintosh’s quest for Habib From The Carwash was entertaining as he was outside the actual Car Wash center. His promo was decent, but with the Suicidal Six-Man Title out of the picture, their feud has suffered, seeing as it is about how Habib “stole” a Belt from Macintosh that Habib no longer even has. It needs more of a personal edge. We’ve also never heard any promos from Habib. He’s shown his skills in the ring, but can he talk? – Did we need to see the same Monster’s Island hype video that highlighted their appearance from a few weeks back? The same exact attack? Can we see something new from them? – The backstage segment with Phillip Simon the II with Brother Jesse by the showers about a proposed “baptism” was just strange, especially with David Adams who appeared towel-clad out of the shower, followed by Chris Payne, who emerged from a curtain and threatened Simon, who grinned the whole time. Plus, “I Dropped The Soap” jokes? Really? – The Payne (w/Tessa Blanchard)-Simon II (w/Brother Jesse) match was okay. It was a lot to take in at once and it seemed Payne was the heel backstage, but a face in the ring. Payne has good promo skills, but what’s his exact gimmick? Is he just a straight-out tough guy? – Brother Jesse talked bad about Blanchard and told Simon to “turn the other cheek.” Their act is different, but what exactly will it bring to PWS in time? – The Reality Check/Drunken Swashbuckler-Jackson Family (w/Shining Edward Jackson) 4-on-4 elimination tag was a “brawl” kind of tag match with spots outside of the ring and inside. The most memorable thing to come out of this match was Foley giving Jackson the Mandible Claw after he interfered and pulled the Referee out of the ring before he could count to three when Swashbuckler hit his finisher on Bahh. Bahh looked strong again, and he had assistance from Myers and a Singapore cane. – The Matthews promo showed him pissed off, throwing various things backstage and ambushing innocent wrestlers training. This made him look like a bully, not a sympathetic figure. – This week’s “wrap up” promo package featured Johnny Howl, Big Deal Craig Steele, Damian Gibbs/Beefcake Charlie, The Untouchables, Team Espana, Chris Payne and Edward Jackson throwing up in a toilet. It’s a good way to put everything in perspective and hey, it worked for ECW in the 90’s, so why not here? No matches were hyped for next week, but we guess we’ll just tune in and see what happens. – The Handicapped Heroes (w/Hush)-Team Espana match highlights showed off the “disabled dominance”of Gregory Iron and Zach Gowen and the fight of Team Espana. It might have been good to just show the whole match, but the show was already loaded. This was a problem through the whole show, as almost every match was edited for time, jumping to certain parts, and was chalked up to “delicate camera equipment.” Kinda lame. The appearance of the Insane Clown Posse giving props to The Handicapped Heroes was also random. – Matt “The Bad Apple” Macintosh protesting outside of a Government Facility Building against Habib From The Carwash starting a “movement” to get his Suicidal Six-Way Title back was pretty entertaining. The misspelling of “thief” on the protest sign was a nice touch. He approached who he thought was Habib and threw him into a dumpster, before realizing it wasn’t him and closed it. This was one of the first times we were able to see that Macintosh can be a funny heel and actually has some personality. He was a star on this episode. – Jerry Lynn serving as the special guest timekeeper for the Suicidal Six-Way Title match between Brian XL, The Amazing Red, Shynron, Habib (Champion), Matt Macintosh and Lifeguard was interesting, more of the “big name” involvement in the company. Headed into the match, it seemed Macintosh would somehow play into the finish, as the only thing that hurts this match concept was that the four other men just seemed to be there to fill the spot, as Macintosh was the only one pushing to get the Belt, until Red emerged out of nowhere. Nevertheless, the match had its moments. Habib has the charisma to pull off this gimmick, but him spraying an opponent in the face with a spray bottle seemed heelish. The superplex spot into the outside of the ring on the other wrestlers was great. Headed towards the finish, the action was hard to keep up with but Red came out with the win to become new Champion. The Lifeguard tried to take the Title, but Lynn attacked Lifeguard. This probably means that Habib and Macintosh will get a grudge match. – David Adams trying to catch up with The Heavenly Bodies and “Shining” Edward Jackson was a chance for Jackson to put over his clients and he has the mic skills to pull it off. 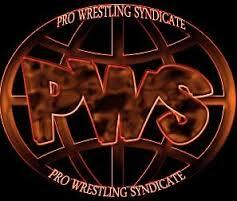 He is almost like the Paul Heyman of PWS. – Monster’s Island is a respectable group in terms of their ring skills and utter dominance being monsters and all, but the act is too much like The Wyatt Family in terms of the camera work in the hype videos. Shouting “They’re here!” upon their arrival doesn’t exactly help either. This looked back at their debut last week and asked when they would strike again, keeping their characters mysterious. – Bonesaw cut a promo on Starman that talked about stakes being raised for their #1 Contender’s Ladder Match and it was decent, even with the dramatic music in the background. Starman’s promo style, following a Nintendo character dialogue style with text on the screen, was unique. The hype video made you believe this was a big rivalry. – The #1 Contender’s Ladder match between Starman and Bonesaw was pretty good, but not the most amazing ladder match ever. We have seen those spots before in many ladder matches. It did seem weird though that they would replay and emphasize Starman botching a ladder spot as the ladder gave way under him. Bonesaw powerbombing Starman from the ring onto a ladder set outside of the ring was brutal, but might have had a better impact if it wasn’t already included in the opening montage video. – Next week’s show will show Mick Foley, and The Reynolds Brothers taking on The American Wolves and more. – The backstage promo from Mario Bokara had him quite intense as he got in the camera shot rage-faced and had good words for Cabana coming off as a serious competitor. – The PWS Championship match between Cabana-Bokara was a clash of the serious Bokara and the jokester Cabana, already setting up somewhat of a story. It’s obvious that PWS sees Bokara as a big name being that he’s been Champion the last seven months (as of this show). The match was competitive as Cabana looked good showing a lot of fight but tapped out in the end. Postmatch, Bonesaw attacked Bokara and Cabana with a steel chair. The ICP came down to the ring with chairs and Bonesaw backed out. Not sure where this leads, but okay. – Lifeguard, Craven Varro, Damian Gibbs, Beefcake Charlie, CPA, Macintosh and Dan Maff cut promos for their feuds pushing next week’s show. Good way to close things out.